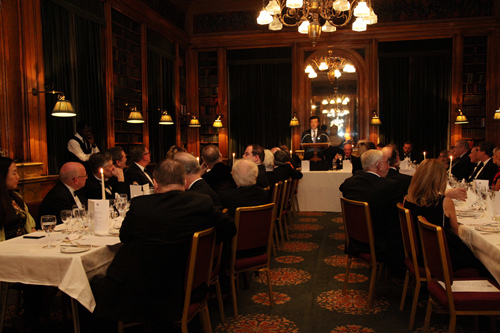 It is a pleasure and honor for me to speak at your time-honored Reform Club. 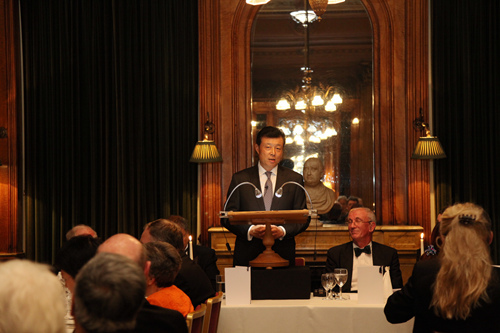 I knew about the Reform Club long before I became the Chinese Ambassador in London. When I was a young student I read about a gentlemen's club in London by the name of the Reform Club. The French writer Jules Verne was responsible for that. I was intrigued by the hero in his book Around the World in Eighty Days. As you will know well Mr. Phileas Fogg was a member of the Reform Club and this is where his famous gamble took place. The beginning and the end of his journey were both here in your Club. Of course I am sure gambling is no longer allowed here nowadays. Nor does it take 80 days to travel around the world, not even by air. 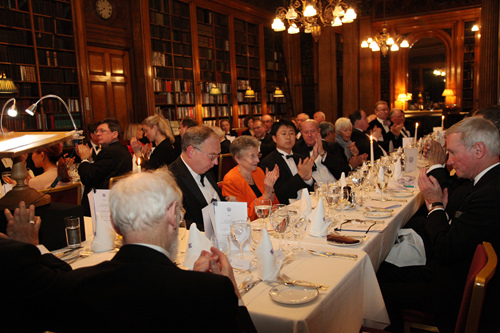 And the Reform Club is no longer limited to gentlemen either. You do have female members now, as I can see many ladies here. So, when I am here at the 'centre of Reformists' to address a group of Reformers, I have naturally and inevitably chosen reform as the theme of my speech! No talk about China in the past 35 years can go without the word of 'reform'. The Third Plenum of the 11th Central Committee of the Communist Party of China in 1978 unveiled a massive reform programme across China. · The policy removed numerous constraints throttling productivity. · The policy catapulted China to become the second largest economy in the world. · The policy turned China into one of the engines of global economic growth. It is an understatement to say that reform has changed China and enriched China. · How to crack the problems arising in the course of development? · How to avert risks of various kinds? · How to promote sustainable economic and social development? China's answer is an explicit one. This is to have greater confidence in reform. It means we will continue to push forward reform with greater political courage and wisdom as well as more powerful measures. Just last week another Third Plenum was held in Beijing. This was the Third Plenum of the 18th CPC Central Committee. This meeting attracted world-wide attention as it drew up a master plan for comprehensively deepening China's reform. There have been much interpretation and deciphering of this Plenum and the reform plan it has set out. I suggest we take a 3-D reading. That is to do a three dimensional analysis with three English words that begin with capital D. These are Determination, Design and Deployment. First, determination. This plenum sent out a clear message. China is determined to free up fixed mindsets and overcome institutional drawbacks. The aim is to promote social fairness and improve people's welfare. As one headline in the Financial Times said: 'Beijing Signals Determination to Unleash Market Forces'. · China wants to fully tap into the potential of all sources of social wealth. · China wants every Chinese to get a fair share of the fruits of development. Second, design, particularly top-down design. In the early days of China's reform, Mr. Deng Xiaoping used a metaphor that has become very famous. He described China's reform endeavor as: "crossing the river by feeling the stones." · There was no experience to learn from. · There were no guiding theories to follow. · China had no choice but explore by itself and face whatever outcome. Now, China's reform has entered the 'deep water'. Any reform measure that threatens vested interests will meet complaints and resistance. This makes top-down design from the central government highly necessary. Reality calls for comprehensive planning and coordination among different agencies by the central leadership. · and forming a synergy in reform. · It is tasked with overall planning, coordination, monitoring implementation of reform measures and achieving synchronized progress. · It will ensure that reforms across China take place in a systematic, universal and balanced way. · It will guarantee reform measures are aligned in policy objective, enhance each other in enforcement and complement each other in results. The third dimension is deployment. · Stick to and further improve China's basic economic system. · Build a modern market economy at a faster pace. · Deepen the reform of fiscal and taxation system. · Achieve balanced development in rural and urban areas. · Build an open economy. · Strengthen socialist political institutional building. · Enforce rule of law. · Apply stricter control and oversight on the exercise of power. · Innovate institutions for cultural development. · Introduce new models for social management. · Better protect the eco environment. · And deepen reform of national defense and the armed forces. A key area among all these is economic reform. The kernel of this issue is to have a proper relationship between the government and the market. Such a relationship should allow the market to play a decisive role in allocating resources, yet at the same time enable the government to play a more effective supervisory role. · Formulate fair, open and transparent market rules. · Adopt a uniform market access regime. · Experiment with a pre-establishment national treatment and negative list approach towards foreign investment. · Increase access for foreign investment. · Harmonize laws and regulations governing both domestic and foreign investments. · Orderly open up financial, educational, cultural and healthcare sectors. · Relax restrictions on foreign investment in such services sectors as construction, accounting, auditing, logistics and e-commerce. · Further open up the manufacturing sector. · Ensure lawfulness, independence and impartiality of judicial and prosecutorial authorities. · Ensure universal and exact enforcement of national laws. · Improve the system for legal protection of human rights. · Reaffirm that the state respects and protects human rights. · Abolish the system of re-education through labor. · And improve the community correction system. · It spells out the specific tasks. · It also sets out a timetable. This gives a schedule to accomplish all reform tasks and achieve conclusive results in key areas by 2020. This means the reform process will be both measured and evaluated. It is fair to say that this Third Plenum has sounded the clarion call for a new wave of reform in China. "China paves the way for reform." The reform in the past thirty five years has lifted China out of poverty and backwardness. Now, the second round of reform from this Third Plenum will realize the great revitalization of the Chinese nation. The reforms will make true for China's 1.3 billion people – the 'Chinese Dream'. Reform cannot be accomplished at one stroke. Nor can it be done once and for all. It is the case in China. So is it here in Britain. If we look back through British history, and take as an example the Reform Act 1832 that was the catalyst to create your Club. The Reform Act responded to the great changes in British society brought about by industrialization and an enlarged electorate. It marked the birth of a genuine modern parliamentary system in Britain. But, do not forget that the Reform Act 1832 is also known as the FIRST reform act. Later Britain went through three major parliamentary reforms respectively in 1867, 1884 and 1918. Even today, the British parliament is still evolving. For example, you have in recent years created the position of Lord Speaker. Nowadays, you are still debating on how one should become a peer and the possibility of replacing heredity positions with elections. So reform is an ongoing process. Institutions need constant updating. The sweeping reform in China will powerfully drive China's development. Moreover, these reforms will bring new and greater opportunities for China-UK cooperation. · There will be a further opening up of the services sector. · And there will be a more predictable legal environment. It also means that Chinese companies and individuals will be actively engaged in overseas investment. They will give full play to their advantages. They will invest in creative ways such as green land investment, mergers and acquisitions, buying securities and bonds and setting up joint ventures. The Third Plenum reforms have set out the goal of achieving balanced and synchronized development in rural and urban areas. This means the Chinese market will multiply. Consumption potential will be unbridled. That offers immense openings for UK enterprise. The reform has also aimed to promote cultural development. This means China will broaden international cultural exchanges, draw on the finest culture of foreign countries, import talent, technologies and expertise. All in all, these reforms will greatly boost China-UK exchanges and cooperation in economic, finance and cultural sectors. Early next month, Prime Minister David Cameron will visit China. He will take business leaders from every sector, large and small. This visit takes place soon after the Third Plenum and all the reforms that have emerged from it. I am sure reform will feature prominently in the talks between the leaders of our two countries. It is certain that the two sides will update each other on their respective views and experience of reform. There will be in-depth discussion on the new openings brought about by reform in both China and UK. It is the moment to jointly draw up a blueprint for the future of China-UK cooperation. The passage of the Reform Act 1832 was not easy. Yet it is the difficulties it met that has earned it a worthy mention in the history books. It is rightly called the Great Reform Act. Today, China's reform is also confronted with enormous difficulties. But the greatness of this cause comes from its difficulty and complexity. Once accomplished, it will have far-reaching influence and usher in a brand new era in China. · We must respect each other. · We need to treat each other as equals. · We should seek common ground while putting aside differences. · And we have to work together for win-win outcomes. With these principles we will be able to find a path for China and UK to forge a new type of relationship between big countries. We will be able to take China-UK relations to a new level.